A. Kahn Design has created another aftermarket program for the Range Rover Sport, complete with Cosworth engine tuning. Afzal Kahn never seems to lack ideas when it comes to customizing Range Rovers. But while his company has earned a reputation for making the luxury SUVs look and feel sportier and more exclusive, it&apos;s Kahn&apos;s partnership with legendary engineering firm Cosworth that gives these custom Rovers the bite to back up their bark. Their latest collaboration is the copper-toned RS600 you see here. Cosworth upgraded its ECU and supercharger to squeeze out an extra 45 horsepower. The result is a total output quoted at 555 horsepowr and 600 lb-ft of torque, hence the RS600 name. Cosworth&apos;s changes allow the Range Rover to hit 60 mph from rest in an impressive 4.5 seconds, down from the stock model&apos;s time of 5.9 seconds. Complementing Cosworth&apos;s work under the hood, A. Kahn Design has added the Copper Metallic finish along with a new aero kit and interior package. The body kit consists of new front grille surrounds, elongated roof spoiler, rear bumper with diffuser, door handles, LED daytime running lights, vented and flared wheel arches and more, all riding on a set of 22-inch Kahn RS wheels. The interior has been retrofitted with high-quality, diamond-quilted leather, new floor mats and a Swarovski Diamonds clock bezel. Exclusive Kahn touches are found throughout the cockpit, including special badging, clock, orange speedo and rev counter. 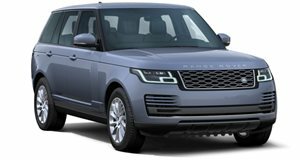 A. Kahn Design prices the Range Rover RS600 Copper Metallic at £55,875, excluding the Cosworth upgrades which will cosr you extra.